Hello Fellow German Shepherd Lovers! This is a picture of my darling angel, Griffin. He is 7 months old and the light of my life. The scenery is of beautiful Hart Lake in Ladysmith, BC. Now that Griffin is getting older I can take him on more challenging hikes, he loves it! He always sticks to my side like glue, I never have to worry about him taking off. He is loyal, intelligent and extremely well mannered. He is the epitome of a German Shepherd in every respect. I consider myself extremely blessed to have this magnificent creature as my very best friend. 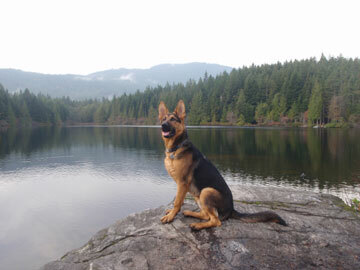 WOW - Not only is the scenery absolutely stunning your GSD is absolutely gorgeous. He looks JUST like mine. Same colors and even same size..
What a cutie I love them!!!! This picture should be the next GSD of the month!! OH, and I don't think we want to hear about how long they live.. Really? Unnecessary..
What a beautiful dog. Enjoy him. Griffin is a beautiful GSD. However, I've never seen an ugly GSD. In saying that, love him every minute. I had my Princess (GSD) for 17 years,11 months and 23 days and then she was gone. Morphyeus (GSD) was 12, Stanley(GSD) was 10 and Molley (GSD) was 12-and they are gone. We now have 3 GSD's (Jake 3, Sausha 10 & Rosey 7) + a Black Lab nearly 14. If I have learned anything it is to cherish them every day and every minute. Their life is short and I feel unfair. We are very lucky to be privleged to care for such beautiful, loving and caring creations from God. Your right, GRIFFIN is an Angel and he is lucky to have you as a care giver. Heck, give him a hug and a kiss from me.